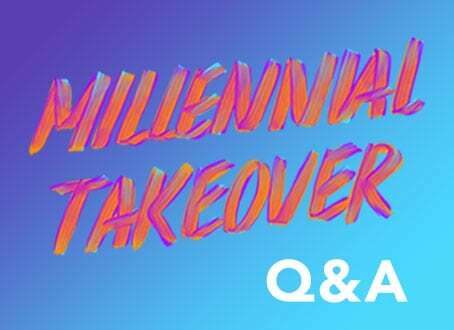 This interview is the fourth of nine in a series of Q and As with leading changemakers, representing the Millennial generation who are working across sectors to be the force for change on the issues they care about most. I’m a mid-twenty-year-old raised on the Southside of Chicago working to abandon fear and advance personal growth. The work I do at SocialWorks constantly excites me. From the initiatives to the workplace culture, we thrive off collaboration and frankness. At SocialWorks we’re aiming to empower the youth through the arts, education and civic engagement. We find ourselves pushing positivity, inclusiveness and leadership, showing the next wave of leaders what is possible with passion, strategy, and discernment. Getting money to the right people! How can we provide funds to individuals without complicating it? All major social action groups in Chicago are run by people working multiple jobs. We talk about wanting change but aren’t funding it. Leaders are literally waiting for organizers to burn out. It’s a sad reality. It’s going to take creativity to solve it and a different remittance address. With technology, the barriers to organizing for action have continued to come down – how do you think that has influenced the way you bring people together to take part in the social change in your community? Technology has influenced the way we bring people together because it adds more plug-ins. Individuals can be a part of the conversation and push our message without physically being here in Chicago. Aids in the camaraderie and the notion that everyone doesn’t need to do a lot but just enough. How do you and the team at SocialWorks meet young people where they are, and galvanize their energy to engage with social issues? At SocialWorks, we meet young people where they are by removing as many barriers as possible, providing forward-thinking support and being candid. There is a reciprocity between young people and us and we make sure to not tarnish that relationship. Moreover, we’re only a handful of years removed from “young people” and we have the luxury of recalling and being present. We’re also rooted in hip-hop; that aids a lot in how we approach tasks. Manifesting SocialWorks—it’s so hard creating something from nothing. Manifesting SocialWorks – it’s so satisfying creating something from nothing. I admire individuals that put themselves out there and lead by action. Whether it’s a small student group galvanizing their peers to vote, creating a bohemia for exchanging ideas, or the community groups that finds an intersection between their passion and organizing, I admire many individuals in Chicago that are finding innovative ways to support their peers while making people rethink. So tough! I think everyone should know that millennials are problem-solvers. This was an awful response. For me, becoming a better man, son, brother, friend, Executive Director. At SocialWorks we’re just getting started and I want to do it right, so solidifying SocialWorks’ place as a Chicago institution. Then, moving on ideas that we weren’t able to execute because of the position Socialworks is in. But before anything, SocialWorks has to be right. A lot of people are counting on us with their paychecks and that’s not something we take lightly. People interested in SocialWorks can go to www.socialworkschi.org or @SocialWorks_chi on any social media channel. SocialWorks—inspiring creativity, building dreams, and letting you, be you.